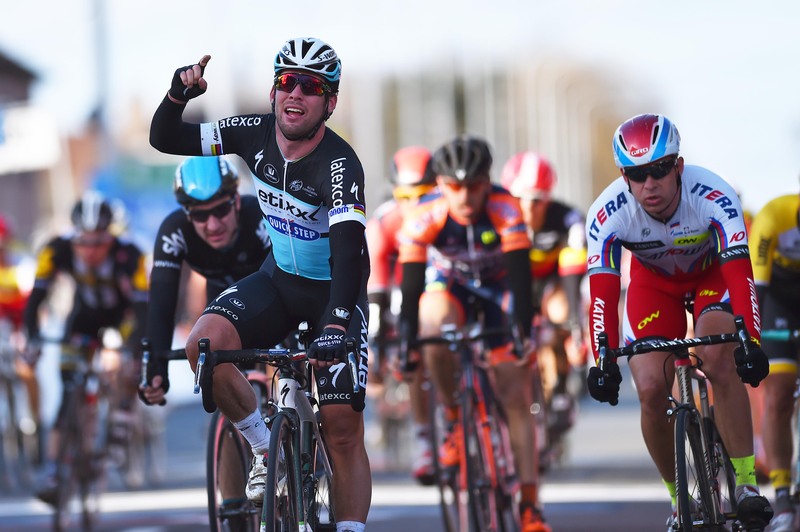 ← 2016 Omloop Het Nieuwsblad Preview – Will Youth Prevail? Last year’s runner-up to Mark Cavendish (whose Dimension Data isn’t racing tomorrow), Katusha’s Alexander Kristoff is the top favorite for tomorrow’s Kuurne-Brussels-Kuurne. 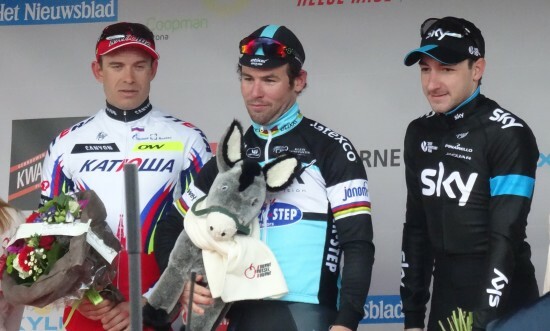 Like last year, Kristoff was nowhere to be seen during today’s Omloop Het Nieuwsblad. I suspect the Norwegian spent much of today’s race adjusting to the weather, reacclimating to the style of the racing, and basically just easing himself into his Classics campaign. But Kuurne’s a different kind of race. While it’s just as long as the Omloop, it’s much easier to control and almost always ends up producing a field sprint (unless the weather is terrible). His team will have to show more willingness to work than it did today, but they should have little trouble controlling things–and will get plenty of help from other teams in doing so. Kristoff’s been the fastest man in the world so far this season, and I suspect he’ll add to his tally tomorrow. Team Sky’s Elia Viviani finished right behind Kristoff last year, and the Italian has the legs to do it again. His build-up to Kuurne has been nearly identical to last year’s, and he’s adept at freelancing field sprints. He abandoned today’s Omloop, but that was more of a precaution than anything else–he’ll be up there tomorrow. Last year was Nacer Bouhanni’s first start in Kuurne-Brussels-Kuurne and he finished 18th. This year he hopes to do much better, fresh off his Stage 2 victory at the Ruta del Sol. Bouhanni’s focused, in-form, and should also benefit from the experience of Cofidis’ new-addition, Borut Bozic. Orica-GreenEDGE’s Caleb Ewan makes his 2016 European debut tomorrow after winning a combined three stages at the Tour Down Under and Herald Sun Tour. Riding his first Kuurne-Brussels-Kuurne, a win tomorrow might be a tall order. But Ewan’s confident, talented, and not to be underestimated. After his second-place finish in the Omloop, I don’t expect to see Tinkoff’s Peter Sagan going too deep to try and win tomorrow. Instead, I expect to see him working on behalf of Daniele Bennati, winner of Stage 1 of the Ruta del Sol and someone not to be overlooked in a race of this sort. And last but not least, there’s Tom Boonen. The three-time winner of Kuurne-Brussels-Kuurne was clearly riding more for training than anything else in the Omloop (leg-warmers and all), but he’s worth keeping an eye on tomorrow. Etixx–Quick-Step often redeems poor Omloop showings in Kuurne, and Boonen’s the type of rider who can sit-in the bunch all day and still fare well in the field sprint. As for the rest of the bunch, keep an eye on Wanty-Groupe Gobert’s Roy Jans, Fortuneo-Vital Concept’s Yauheni Hutarovich (a 2-time runner-up), Trek-Segafredo’s Giacomo Nizzolo and Jasper Stuyven, and Lotto Soudal’s Jens Debusschere (who along with Stuyven might be the best bet to score back-to-back top-10 finishes this weekend). My prediction: 1. Kristoff 2. Viviani 3. Boonen. Who’s your pick to take home the stuffed donkey? Share your comments below.